I would like to take the time to thank Mike for his expertise, knowledge and help. I had called early in the morning asking many questions on Chameleons because I am a beginner and was inquiring about purchasing a Veiled Chameleon for my son Liam’s Birthday. I originally wanted to order a 2 month old veiled chameleon, just because it was cheaper, but Mike had reassured me that a 4 month old veiled chameleon was the way to go. He had said that the 4 month old chameleon would be much heartier and stable. 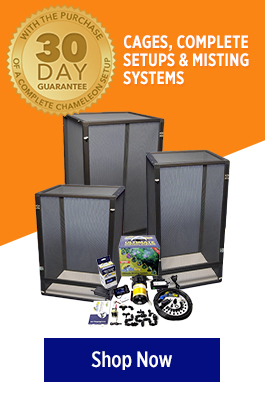 I also purchased the recommended chameleon cage from him and he redirected me to a website for the purchase of the other supplies I would need before the arrival of our Chameleon. He shipped out our cage and told me the minute I received my cage and had everything I needed set up to call him and he would ship out our Chameleon immediately for next day delivery. Well, with all his advise and help on my other purchases we were all set up and ready to go. I called and said, ‘I am ready to go’ and the next day received our Veiled Chameleon known by the name now ‘Echo’:. Echo was healthy, packaged beautifully and took to his new home. My son Liam and 5 other children are so excited and cannot stop watching him; and I have to admit my wife who was not a huge fan of animals and reptiles has fallen in love with Echo, she admires how peaceful and cute he is to watch. We would all like to thank Mike in his fascination with these creatures, and the statement he made is true,’ Chameleons are one of Gods most fascinating creatures.’ Thank you again Mike and family from ours, Bob, Karen, Joey, Emily, Liam, Aidan, Reilly and Max.